Following the success of the open event in January 2015 we have decided to continue with the open day format as part of our awareness building campaign in support of elderly people in Nigeria. Every September Alzheimer associations across the world take part in an international campaign to raise awareness and challenge the stigma faced by older people living with dementia. Last September you may have seen us marching through Ibadan to raise awareness about dementia in our country. 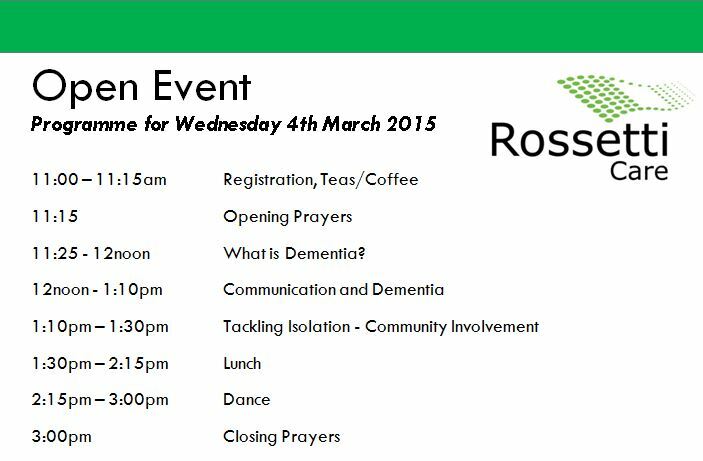 This year at Rossetti Care, we are working with the theme to inform people of ways to reduce the risk of getting dementia as well as raising awareness about how we could better care for our loved ones living with dementia. The programme starts with a Communion Service followed by discussions, singing, music, dancing and good food at our main building in Tose, near Moniya. Please join us at 3pm on Sunday September 21st at Rossetti Care, Wahabi Olayiwola Layout, Tose, Moniya, Ibadan. We do not have to look far to see that Nigeria’s aging population is growing. As our baby boomers get older and approach retirement it is vital that we start to understand and plan for their, and our, care needs as well as the already aged people with we live with. Part of this is to reduce the risk of getting dementia as we age. Research shows that there are five main drivers to reducing the risk of developing dementia. They are good care of your heart, keeping physically active, having a healthy diet, keeping mentally active and being in good company taking part in social activities. We all know a mischievous Uncle, Auntie or grandparent and we love them. Old people, and especially old people with dementia, can be a challenge but they can also be great fun and they still have the capacity to enjoy themselves heartily. Come and see this for yourself by joining us on 21st September 2014 to celebrate our older people, learn more about how best to care for them and get information about how help reduce our risk of developing dementia with brain healthy lifestyles. Rossetti Care is pleased to sponsor www.DementiaNigeria.com a new information resource for people living with dementia in Nigeria. DementiaNigeria.com will feature articles, events, news and information to promote positive care for our elderly Nigerians, especially those living with dementia.